Brähmer, a southpaw, was agressive from the start with Averlant careful and covering up well. In the second Brähmer went to work and Averlant blocked punches to the head and left his body open and Jürgen scored with a terrific left hook to the body. Averlant went down, made it almost up but couldn’t breathe and fell over again and it was waved over. It was ruled a knockout. Brähmer retained the EBU title. Averlant was coming off surgery to his right hand was probably a bit unprepared because of that. Culcay won the WBA I/C title with close win over Culcay, who I like many others felt had done enough to retain the title. Scores were 116-112 and 115-113 for Pitto and 115-113 for Pitto with many rounds close and difficult to score in a partly excellent boxing match were styles blended well. Pitto kept coming, tall but crouching low and throwing short hooks and uppercuts from both hands mixed with bigger punches from the outside. Culcay was effective in scoring with counters and made Pitto at times miss badly but posed a bit and probably let some rounds slip away because of that. Pitto was cut over the left eye in round seven. Chervyak, a small somewhat overweight fighter, hurt Dirks in the third with a right and it could have been stopped then and there. 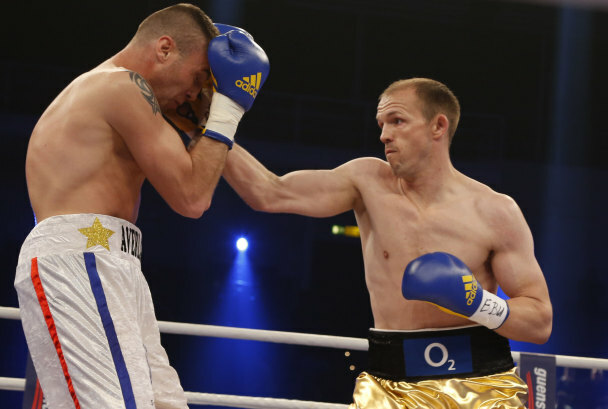 Dirks came back somewhat in the middle rounds as Chervyak tired but Dustin was trailing on the cards when hurt again early in the tenth and it was stopped as trainer Otto Rahmin waved the towel. Chervyak was ahead on scores of 90-80, 88-83 and 88-82 after nine. Chervyak won the WBA I/C title. Arslan won on scores of 98-92, 99-91 and 99-92 after a workmanlike performance. Vekiloglu came on a bit in the last two but it was too little too late. 78-73 twice and 80-73. Zeuge controlled the fight from the outside but Guy got on the inside all Tyron could do was hold on and it made for an ugly fight. 79-73, 80-74 and 80-72. Kölling is good with a lot of talent and he won clearly but shows an almost amazing lack of ability in hurting his opponents - against Tchoula he landed with clean shots to the chin - and nothing happend. Seres took a standing eight count in the first and was badly cut over the right eye. Ceylan continued to dominate and hurt Seres against the ropes with punches to the head and body. The cut was by then pretty nasty and after an inspection it was stopped. 40-36 on all cards with Yigit, a southpaw, scoring well but Hramyka, bleeding badly from the nose, was survivalminded and lasted the distance. Kurakins was hurt by bodyshots in the first and stopped in the second. The BBU Int´l title was at stake. 60-56 on all cards. Fight of the night as Fjodorovs came on strong when the local hero tired. Iljusjenko went down early and easily and was unwilling to continue. Potjomkins was counted over twice in round two and stopped in the thirt hurt by bodyshots. Bogdanov won the vacant WBO Oriental featherweight title.